I had for so long wanted to go into the jungle and live my dream. I wanted to go in for multiple days taking with me no food. 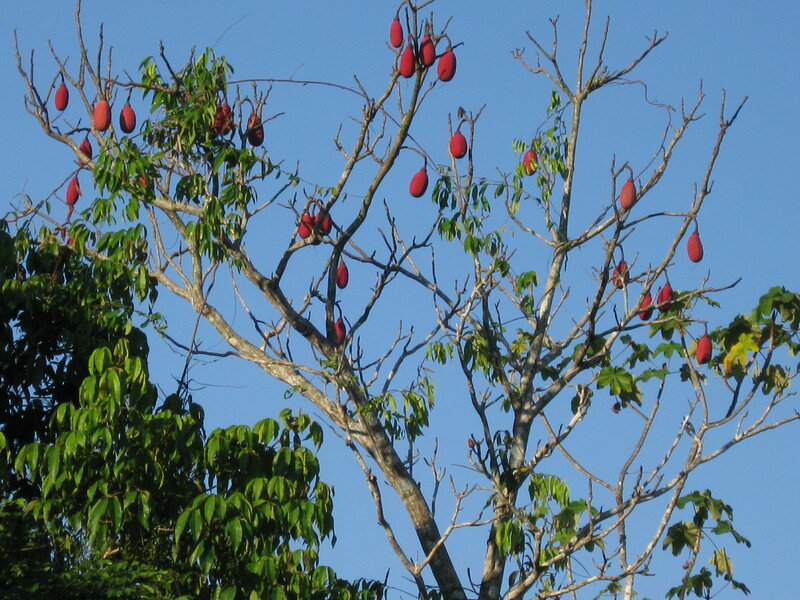 I wanted to sleep in hammocks between trees, and eat only what we caught or picked. I wanted to learn about traditional ways and who knows? Maybe even visit some of the tribes that live deep in the jungle. 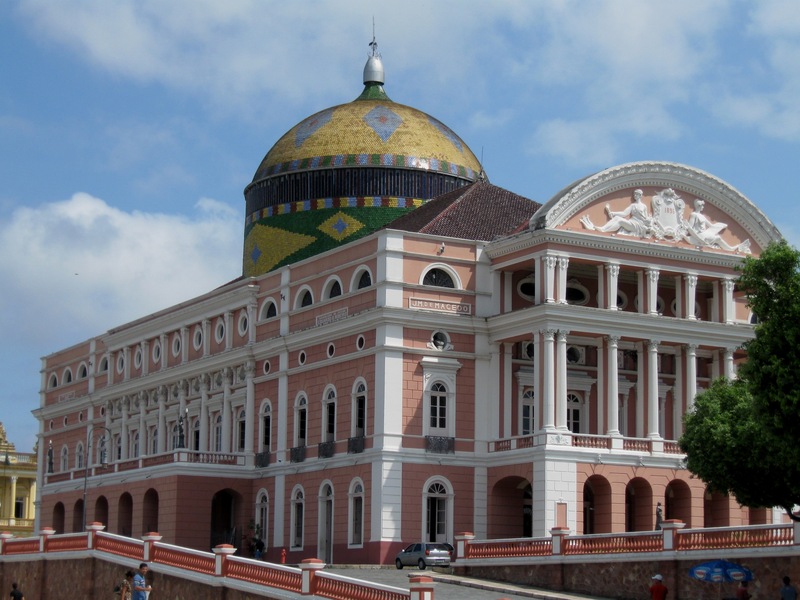 On arrival in Manaus, I found there are plenty of travel agencies that say they cater to just that. 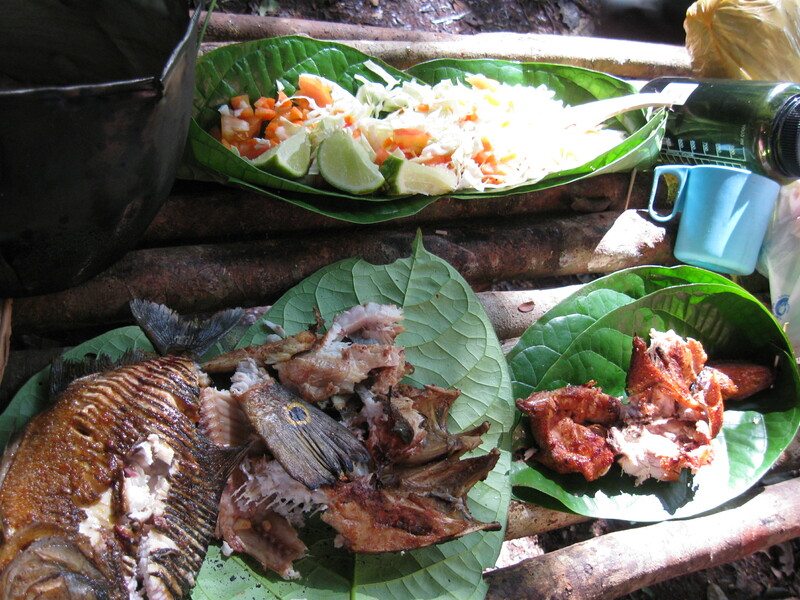 There are standard packages – three days/two nights or four days/three nights where they take you by boat into the jungle and you sleep in hammocks between trees. 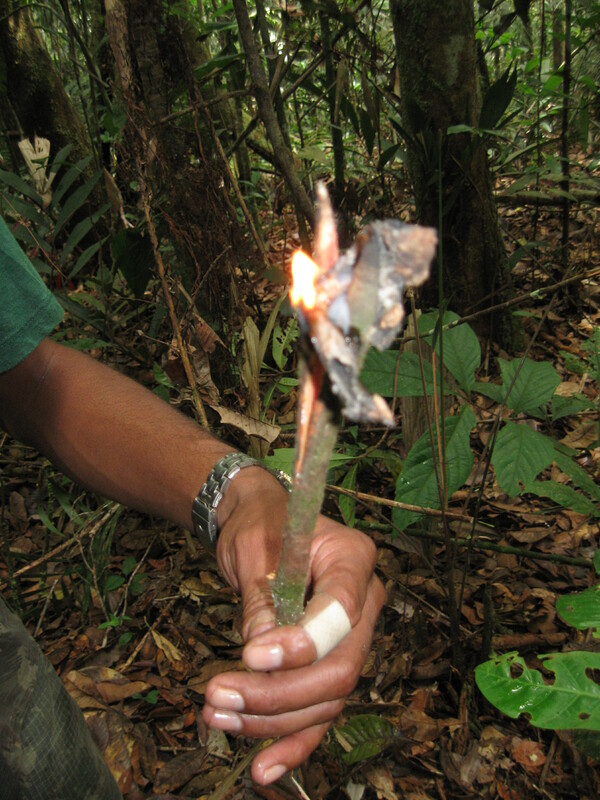 The guides are well educated in the lore of the jungle and show you many traditional uses of plants. I went on one such trip and it was fun. 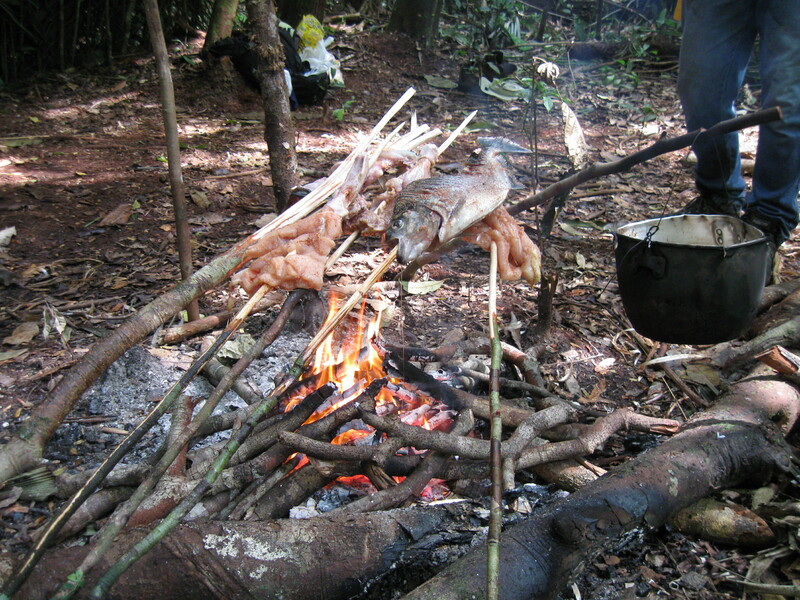 But there was a pre-made shelter in the jungle and we ate the chicken we had taken with us, barbequed over a fire. The company was fun but my mind nagged at me. This wasn’t quite what I had in mind. So I took to pestering everyone I could find. I had run through the travel agents – I had a sneaking feeling they had begun placing bets. So then I started going to the markets and badgering the vendors. Wasn’t there anyone who could take me? Didn’t any of the women have a brother or a husband of a nephew? By the third day they would start laughing when they saw me coming. I magnanimously provided them with free entertainment. But the next day one of the women said she knew someone who could help. His name was Marcello and he was a guide with a lot of experience. Off I went to meet him. “It is too dangerous, what you want” he said. “If either of us get bitten by a snake or animal I don’t know how to keep us alive until we can get to the nearest village”. “Oh” sighed I, trying to accept this was not to be. The deflated balloon that was I inflated itself rapidly. I did not have to say anything; my grin said it all. As we walked to the boat that was to take us to Luis’s house, Marcello told me that sometimes Luis has a fight with his wife and then he gets into his dugout and disappears in the jungle for weeks. “Yes, yesterday” came the reply. “Why?” asked Luis. “Do you want to go into the jungle?” asked Marcello. We met, negotiated the costs, figured what we needed to take with us and I got back to the hostel. The price was steep and I was not going to quibble over it. But it wouldn’t hurt to find another soul who was ready for adventure. Most of the others at the hostel thought I was missing a brain and had taken pains to point it out to me in the last couple of days. But there was one person, Ximo from Spain who had arrived a day ago and was intrigued. A judicious combination of coaxing, cajoling and bullying and Ximo was ready to go. We packed some clothes, sunscreen, mosquito repellant and rolled up our hammocks and were ready to leave. The next day Marcello came to fetch us. We were going to buy gasoline for the motorized canoe and several large containers of drinking water. He had already gathered rope, machetes, fishing line and nets. The harpoon, he said, Luis would bring. He also brought along a couple of mosquito nets for Ximo and I. When I asked about him and Luis, Marcello just waved it away. I suppose the macho men-of-the-jungle have no use for such fripperies! We met Luis, loaded the canoe and took off. I was so excited I could barely sit still. This was real! We were really going into the jungle! Luis wore no shirt, a seen-better-days pair of pants and a hat with a frayed rim with a lot of character. He had a cigarette dangling from the edge of his mouth. It was barely after 8 am and already it was blisteringly hot and the sort of mugginess that makes you sweat sitting still. We left the harbor and headed to the Rio Solimoes. It was a clear day and under the blazing sun, sitting on the bench soon turned into sliding down to slouch along the floor. Until I felt my backside getting suspiciously wet. Marcello grinned, handed me a bucket and mimed bailing water. 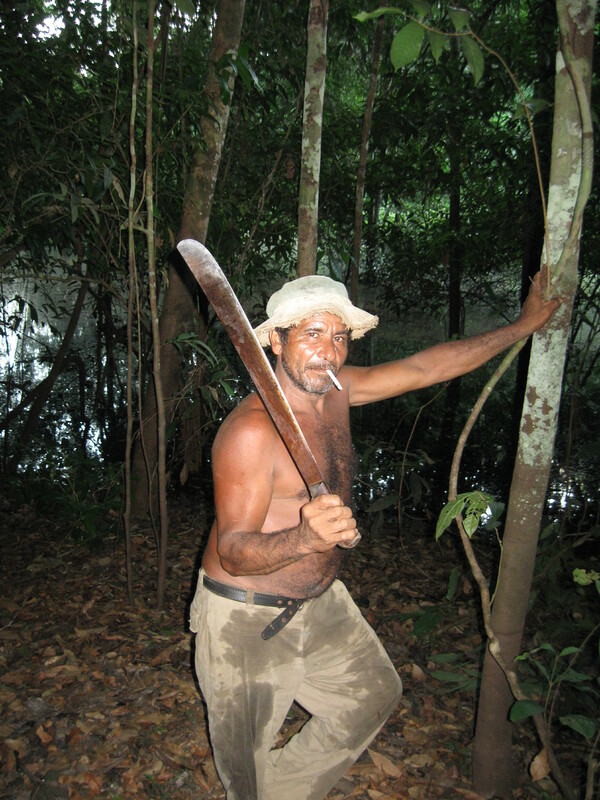 The chores were clearly delineated – Ximo and I were to bail water, Marcello manned the motor and Luis was up ahead with his machete, clearing the way as he hacked at branches that obstructed our path. And there were a lot of overhanging branches. They had paid keen attention to my “I don’t want to see footprints” rule for our little trip. This became our pattern for the days that followed. 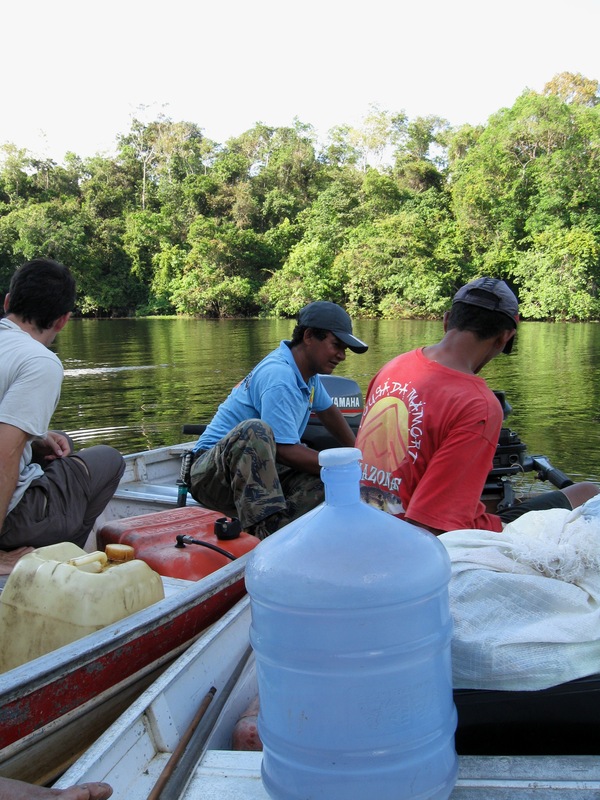 During the day we would glide along the water and Luis would point out interesting things. 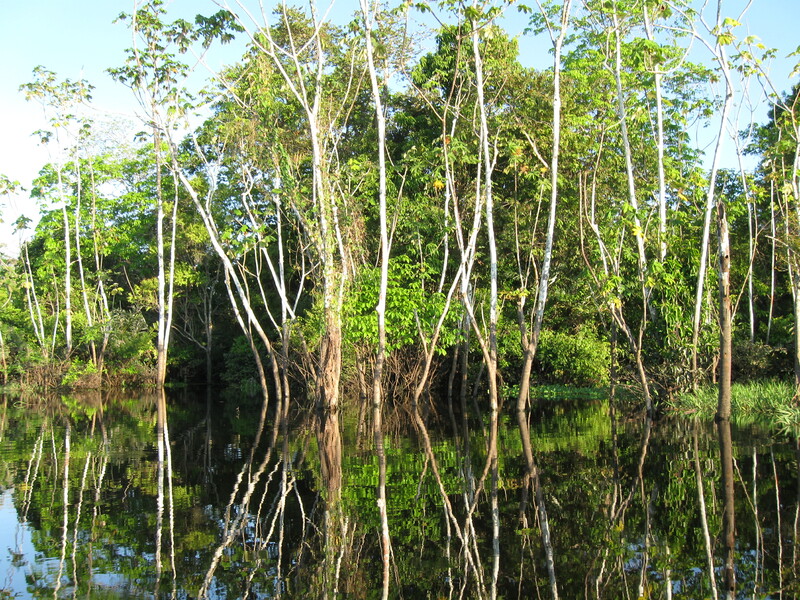 The summer months are the high water season in the Amazon and by July the water level had risen by ten to fifteen meters. We were gliding along the treetops. We saw trees that I had never seen anywhere else. One had bright red balloon-like fruits while another had soft cotton-like fluff inside. 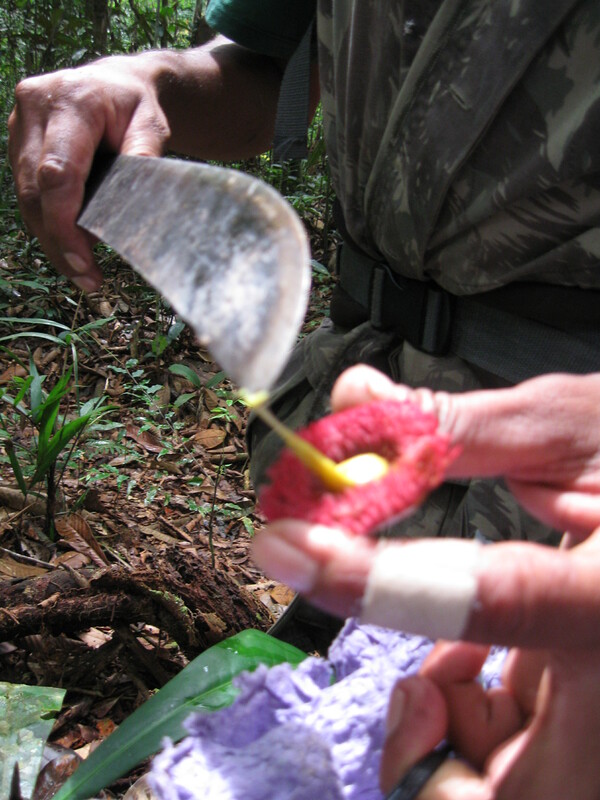 Some had berries we could eat while others were traditionally used for making jewelry by the tribes. We were on information overload! Along the way we saw river dolphins. They never quite jumped out of the water but once in a while we could see the rounded back of one as it surfaced and then dived back in. We saw the fangs of a tarantula up close. Luis would dip in his hand and pull out baby alligators for us to examine. 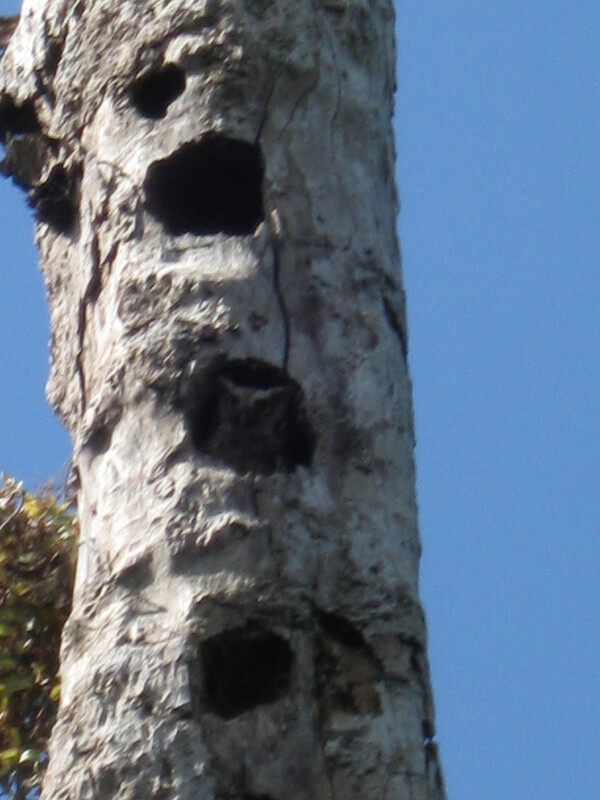 In the middle of one particularly dense thicket, we saw a sloth. Luis was the one who spotted it. 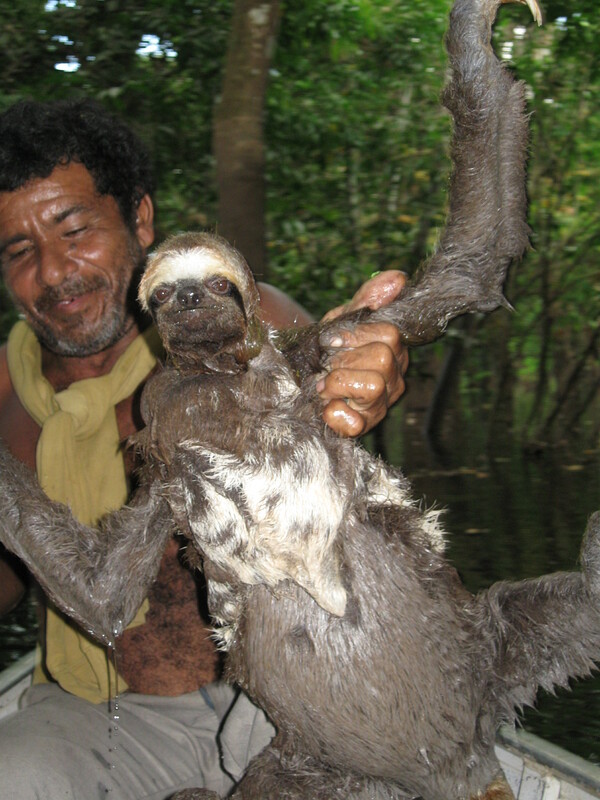 And proceeded to haul it in his arms – Luis and his friend, the Sloth. This was a man who did not speak much to humans. But he could talk to animals. When we were in the boat, Luis would make a sound. And soon we would hear the same sound coming from different directions. The animals were answering him! And based on the sound he heard, he could tell the size of the animals. 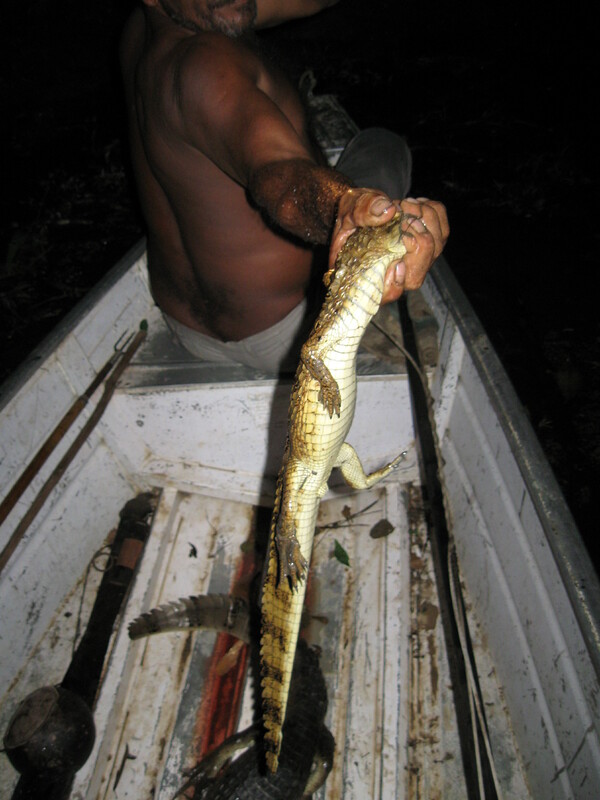 Monkeys, birds of different species, even alligators, none were not proof against Luis’ call. 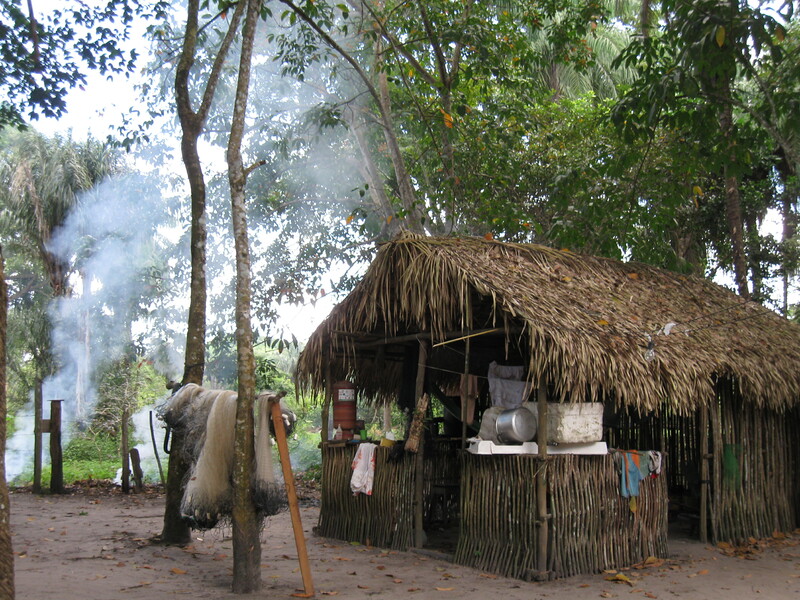 Sometimes we visited small villages lying deep in the jungle. Thatch-roofed houses made of bamboo strips were sometimes next to ones made of bricks with a satellite dish in front. Chickens scratched in the dirt and geese quacked nearby. There were children – thin they were, with bony shoulders poking out of tattered t-shirts. Unsmiling faces turned into broad grins once they got used to us. Luis was well known and well-liked and we were made welcome. Many of these villages earned a living cultivating rubber trees. The tree barks were scored with stripes with a tin cup attached to the end to catch the sap. Once the sap was collected, it was boiled and cured and then layered onto cloth. The end result were colorful rubberized sheets. When we stopped at some place, we would pull up the boat, make it fast and go on what I was beginning to think of as our nature walks. Luis and his family have lived in these forest for generations and there was such an incredible amount that he knew about the plants and animals. As we walked, he would pull some leaves off one bush and say that if you have a headache from alcohol, you should drink tea made of these leaves. At another bush he would break off a twig and say, if you have a cut and need it to stop bleeding, you have to rub this twig on the cut. Of course I had to try it. A shallow cut was not hard to make and rubbing the twig really did make it stop. Instantly! I was spellbound. He would break off something from another tree and say if you need to build a fire and everything is wet, burn this. If you need glue, try this sap. If you need fresh drinking water, cut this vine. If you have a broken bone, pad it with a poultice made of these leaves. He even knew of a way to shrink a tumor, he said. And he knew how to keep you alive if you are bitten by a snake. I was spellbound and speechless. 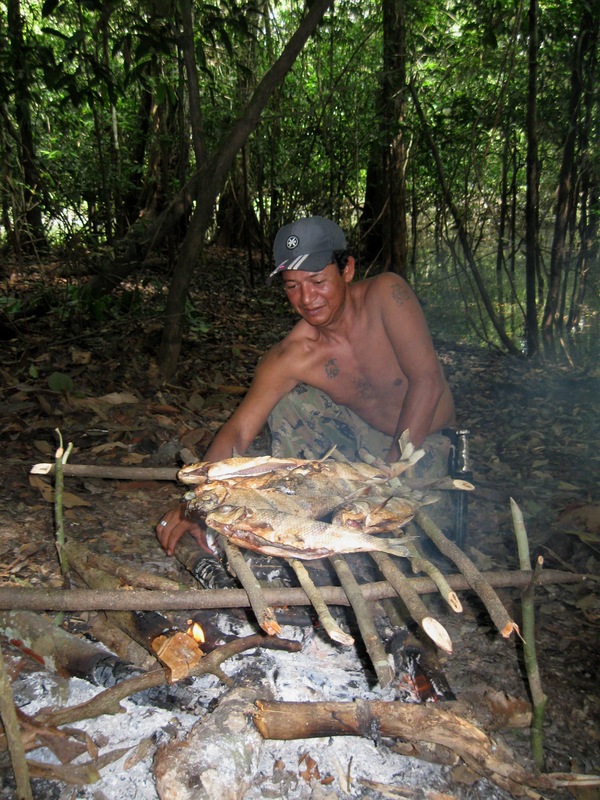 There is such an incredible wealth of knowledge in these tribes and in the Amazon! You can walk in naked into this jungle I thought, but if you knew what to do, you had food, shelter, clothing and medicine. But what lies ahead? With the increasing clear-cutting of the rainforest, the trees, shrubs and bushes will soon disappear. With them will disappear the tribes and with them, this wealth of knowledge. I wonder if we truly realize what we are losing. Will the realization come too late? 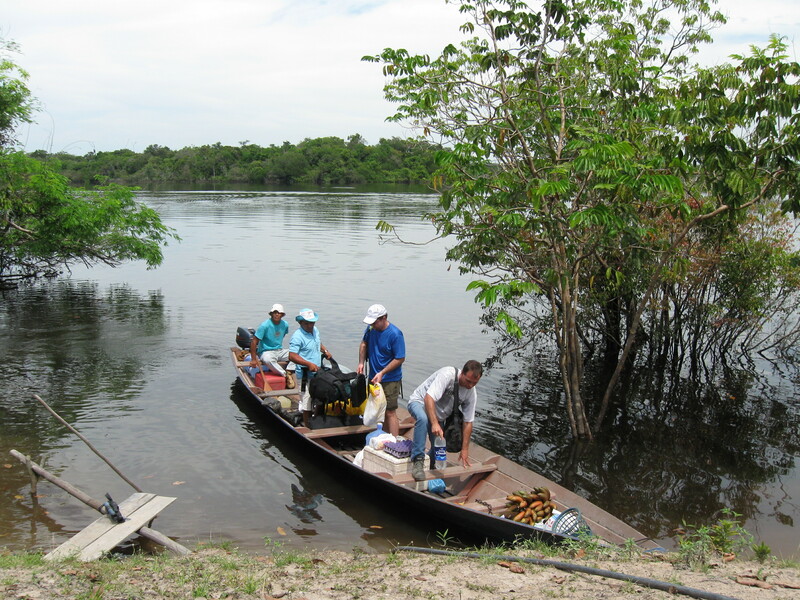 Unlike the Rio Urubu, this river, the Rio Solimoes was supposed to be rife with mosquitoes and so it was. “You wanted to go where there were no footprints”, he said. Well, in places like that the mosquitoes live”. Luis had heard our exchange and motioned for me to follow him. He took me to a large tree and told me to tap it and then put my palms flat on the tree. I did. Soon there seemed thousands of ants had crawled out of tree and clambered onto my hand and forearms. “Stay still” said Luis “until there is enough”. Enough for what, I wondered. But knew soon. 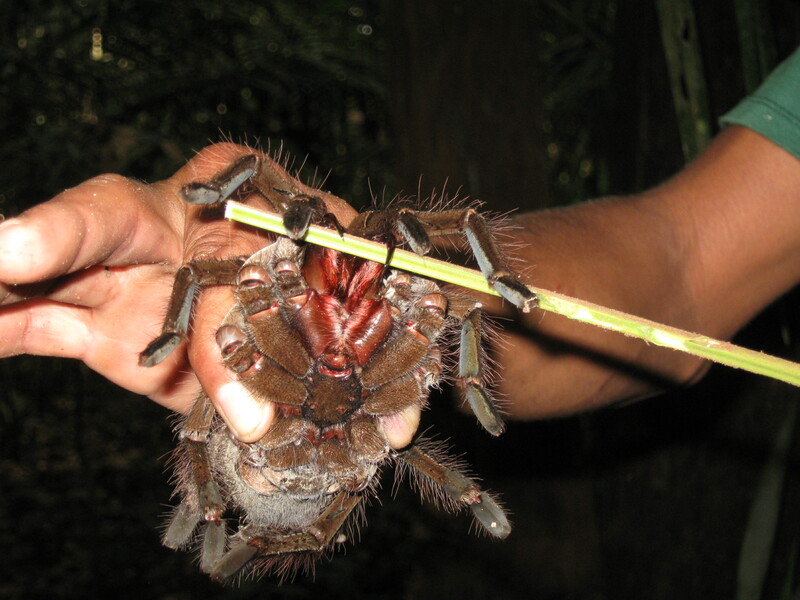 When my arms were almost black with crawling ants Luis told me to crush them against my skin. I did. And voila, there were no more buzzing mosquitoes, no bites. I could not believe it! So this is the Amazon’s answer to DEET I thought and a better one by far! There on out, when the mosquitoes were getting to be too much, I would yell out “Tapiba, Luis, por favor, Tapiba!” and we would then find that particular tree and go through the ritual of smooshing ants on my skin. And feel relieved until my sweat lay my skin open to the ever-present bloodthirsty mosquitoes. 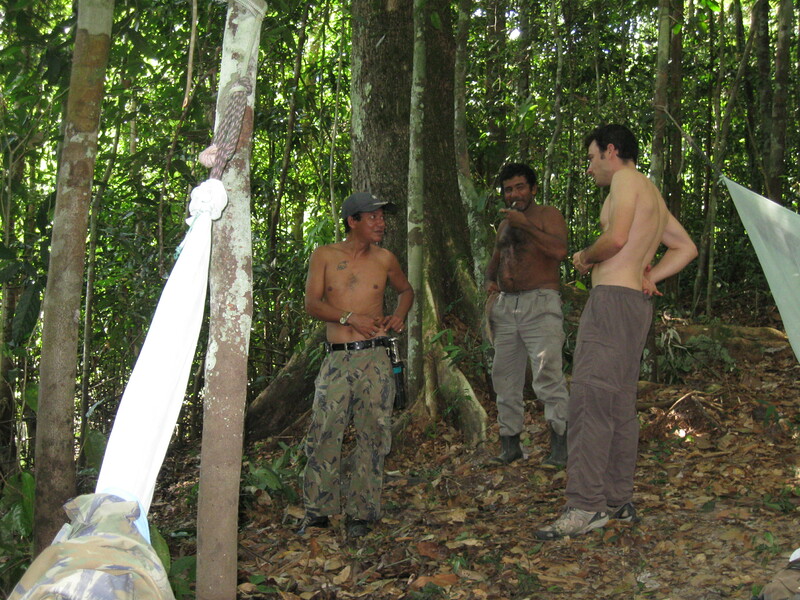 When we stopped for the night, Luis and Marcello would clear a small space with the machetes. And then we would string up the hammocks. Ximo and I had the job of fetching water and kindling. 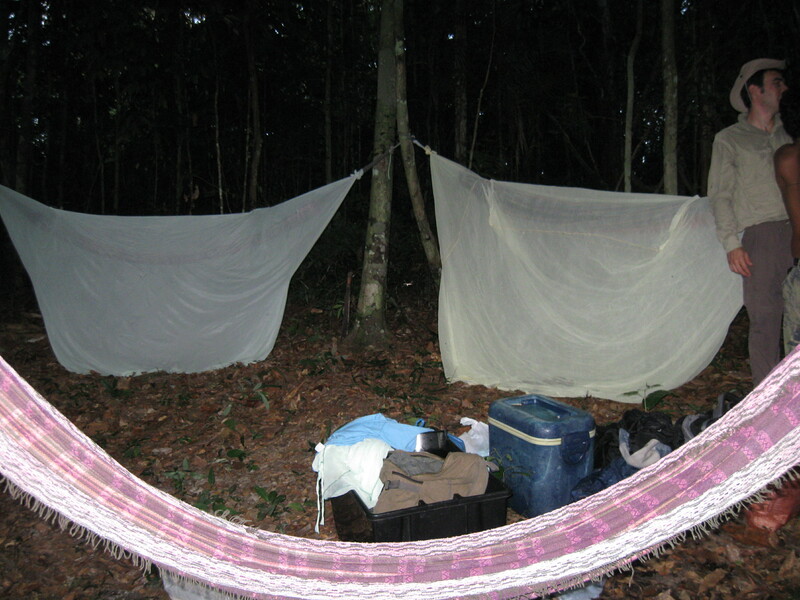 Once the hammocks were up, we draped Ximo’s and my hammock in the mosquito nets but neither Luis nor Marcello bothered with nets. In fact, more often than not they went bare-chested. I have no idea how they managed. Ximo tried it one day. He lasted five seconds. A good chunk of each day was spent on catching food. 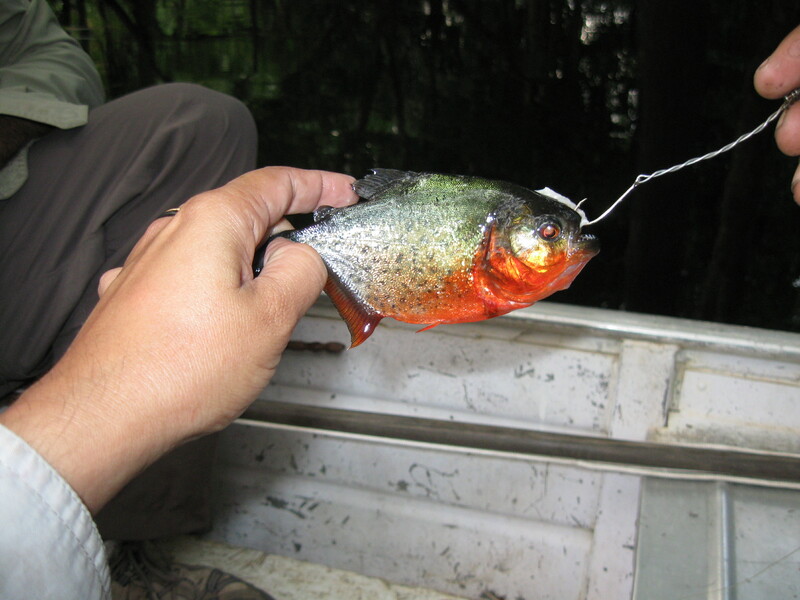 Fish, large and small, and especially in these waters piranha. But these are fish that care not for earthworms or bits of other fish as bait. It is pirhana that is the best bait for pirhana. Those rows of razor-sharp teeth can make mincemeat out of anything put between their jaws even when they were pulled out of the water, hooked. They were surprisingly tasty. But they were small. We had to catch a large number of pirhana for the four of us! One day however, Luis decided on a change of diet. We got into the boat toward dusk and he took us to a place that we had not been in before. It was dark by then. Ximo and I were told to turn off our headlamps and remain quiet. It was totally dark – the sort where you cannot see your hands a couple of inches in front of your face. The buzzing, zinging, clicking, pinging sound from the forest was almost deafening. We sat and waited in the boat as Luis “called”. What was he calling? I wondered. I had my answer soon. Alligators. Based on the sound Luis rattled off their sizes – a meter in length over to the left, at 10 o’clock. Over there to the right about 2 o’clock one and a half meters. 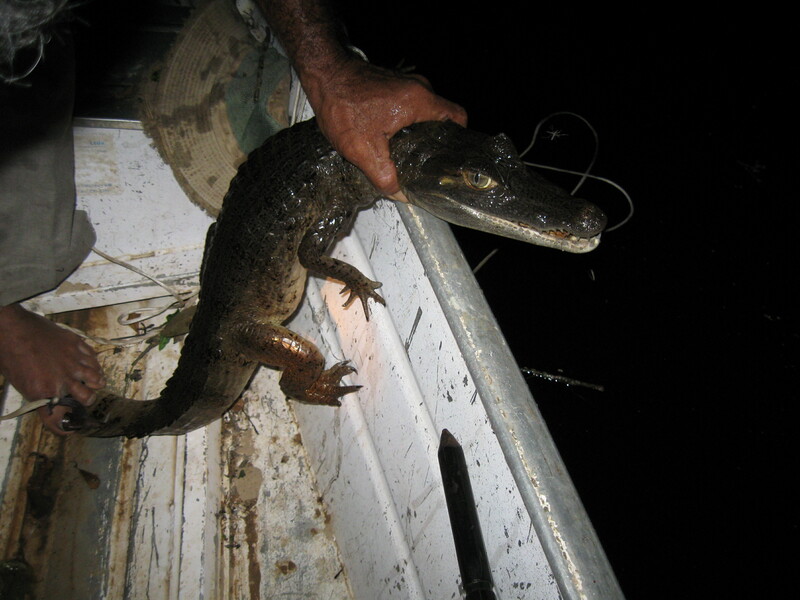 And at 4 o’clock, a granddaddy at 3 m. I don’t think we really need a 3 meter long alligator I squeaked. Just a meter would be fine. Luis threw in his harpoon – all of this in the pitch dark. And we heard the waters boiling up and then he pulled in the alligator. 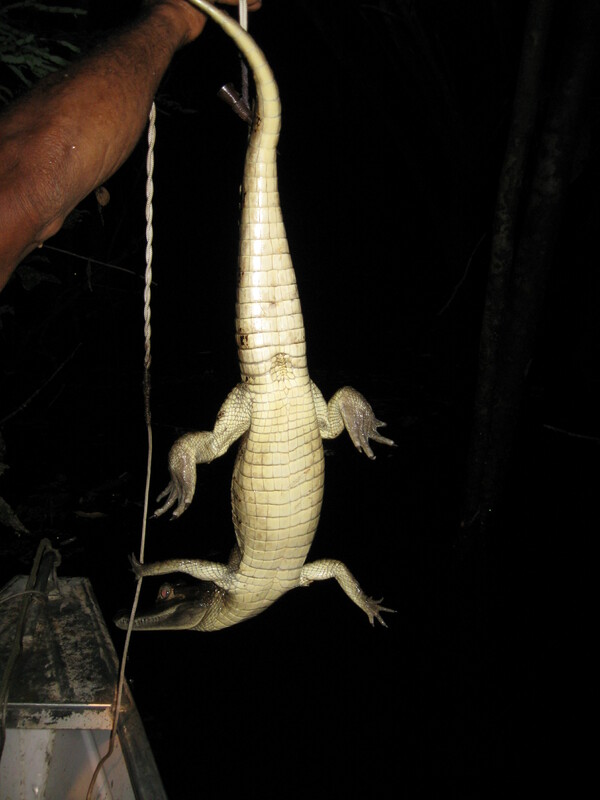 We turned on our headlamps and there at the end of the rope dangled a very disgruntled alligator. Before we knew it, it had been dumped into the canoe and was thrashing around at the bottom. The canoe dipped and swayed precariously. “Marcello” I said. “I can’t swim you know”. At the end of our trip, Luis invited us all back to his home – for a meal and to stay if we wished. On the porch was a snake skin. Not just any snake – an anaconda, easily four meters long. 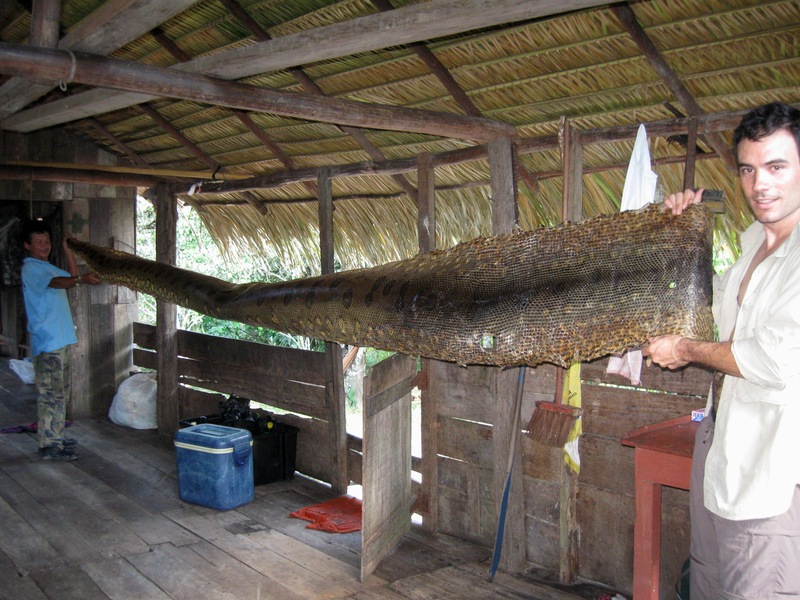 Luis said he had been out swimming when the anaconda had him in its clutches. A struggle ensued. The result? The skin is lying on Luis’ porch being cured, waiting to catch a fine price at the market. Above the rafters overhead I saw a deerskin and an alligator skin stretched flat no doubt meant for the market as well. 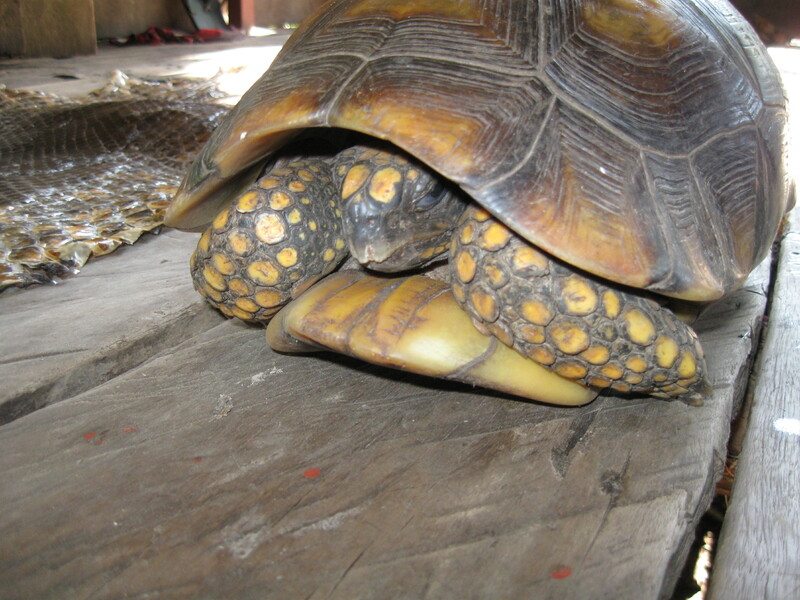 On the floor was a turtle, its shell easily some 30-40 cms in diameter. It is a pet and has been for a number of years. It hissed at me when I unwittingly intruded into its corner. And we met the pet parakeet who calls out saucy insults. We met his wife who cooked us a meal we did not have to catch and we spent a mellow evening listening to stories of life in the jungle. Thanks! 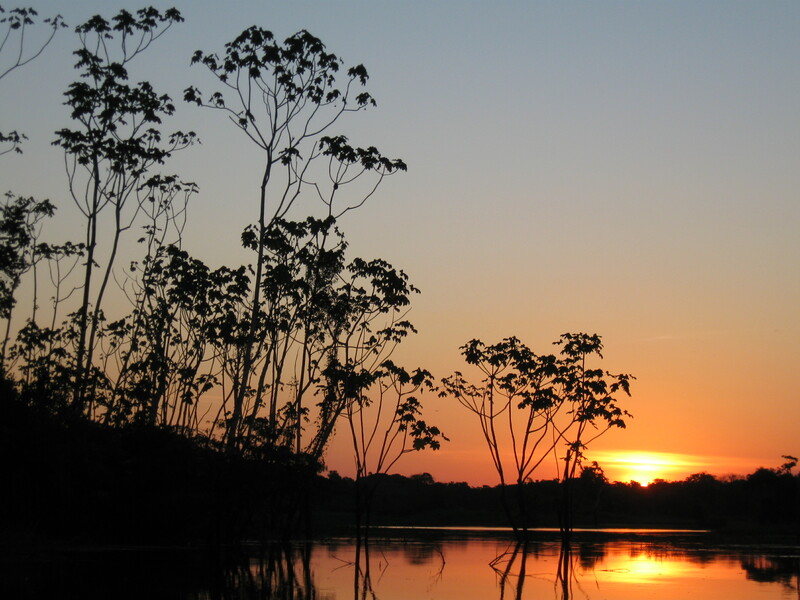 The Amazon is quite incredible – the sheer diversity of flora, fauna is amazing. But add to that the tribal cultures and the collective wealth of knowledge regarding traditional foods and medicine and it is truly mind boggling. But given the rate at which the rainforest is being decimated, how much longer we will still have it is anyone’s guess.